International reactions after the confirmation of the killing of Saudi journalist Jamal Khashoggi inside the Saudi Consulate in Istanbul almost three weeks ago came swiftly. 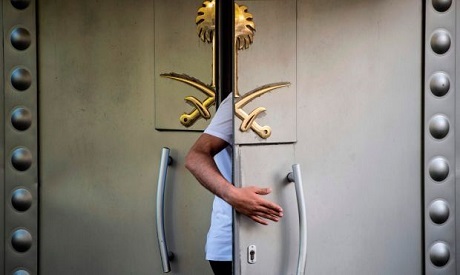 Western countries called for those responsible for Khashoggi’s death to be held to account, for the immediate recovery of the body, the suspension of arms sales, and a UN-led investigation, especially with so many questions still hanging in the air and so many versions of the story told. Events are moving rapidly, and the fallout could affect the Middle East and the world on many levels. Vehement condemnations were followed by some soul-searching and difficult questions: Did the West facilitate this incident by overlooking past abuses, mentioning words like human rights and democracy in its foreign policy statements less and less? Aaron David Miller, vice president for new initiatives at the Woodrow Wilson International Centre and former Middle East peace negotiator in many US administrations, thinks the world is still missing the vital facts. “There has to be a factual basis laid out for what happened to Jamal inside that consulate building. And then conclusions can be drawn about what needs to be done about it,” he said in interview with Al-Ahram Weekly. “So far, we know something terrible happened and we know Saudis are responsible for it. We know Jamal is dead, but we have no idea what happened to his remains. There is very strong circumstantial evidence that this was not a rogue operation. But beyond that we do not have the evidence that is required to answer many questions,” he added. “The Turks certainly have information that they have not revealed, but even if they assert certain things, the question is, will it actually answer or provide additional information that will reveal the motivation behind this killing and who actually knew about it? Or how Jamal died? So, there is no accounting yet, and there is no accountability yet. The first needs to precede the second,” Miller told the Weekly. The furore over Khashoggi’s death grew particularly after Saudi Arabia said in a statement late Friday that he died after a “fist fight” inside the consulate building while a discussion to bring him back to Saudi Arabia went badly wrong, adding that 18 Saudi citizens were arrested over the killing. On Sunday, Saudi Arabia’s Foreign Minister Adel Al-Jubeir spoke to Fox News suggesting individuals had attempted to cover up the killing to his government and that it did not know the details. “The individuals who did this did so outside the scope of their authority. There obviously was a tremendous mistake made, and what compounded the mistake was the attempt to try to cover it up,” Jubeir said. So far, Saudi Arabia said it has arrested 18 people, sacked two aides of Crown Prince Mohamed bin Salman and set up a body, under his leadership, to reform the intelligence agency. The three nations said they would not make a judgement until the explanation had been further detailed. “We, therefore, ask for the investigation to be carried out thoroughly until responsibilities are clearly established and that there is proper accountability and due process for any crimes committed,” they added. The European Union said details of Khashoggi’s death were “deeply troubling” and that “an investigation” was needed. UN Secretary-General Antonio Guterres stressed the need for a prompt, thorough and transparent investigation into the circumstances of Khashoggi’s death and “full accountability for those responsible”. French Foreign Minister Jean-Yves Le Drian said his country condemned the killing of Khashoggi and called for a thorough investigation into the incident, noting that many questions surrounding Khashoggi’s death remain “unanswered”. Spain’s government said it was “dismayed” by information about Khashoggi’s death and echoed the call from the UN for a thorough and transparent investigation to bring to justice those responsible for the killing. Germany went beyond expressing shock to declare it will stop arms exports to Saudi Arabia and urged other EU member states to do the same in a further sign of the growing diplomatic firestorm sparked by the case. Peter Altmaier, German economy minister, said that Riyadh’s explanation of the killing had not been satisfactory. “The government is in agreement that we will not approve further arms exports for the moment because we want to know what happened,” he told the broadcaster ZDF. He also called for a united European stance on the issue. “Only when all European countries agree does that make an impression on the government in Riyadh,” he said. “It has absolutely no positive consequences if we stop arms exports but at the same time other countries fill this gap,” he added. Under an agreement reached between the parties in Germany’s “grand coalition” government this year, Berlin restricts arms exports to all countries directly involved in the war in Yemen. Saudi Arabia leads a coalition there fighting Iranian-backed Houthi rebels. But the curbs set out in the coalition agreement do not affect pre-approved deals. This might now change. Seibert said Monday that the government was checking whether it could stop arms exports that have already been granted permits. A spokeswoman for the Ministry of Economy confirmed existing permits could be revoked. The oil-rich kingdom is the second-largest buyer of German arms, behind Algeria. Berlin approved €416.4 million ($480.1 million) of weapons exports to Riyadh during the first nine months of 2018. Britain also called for urgent clarification of the circumstances surrounding the death. “There remains an urgent need for clarification of what happened beyond the hypotheses raised so far in the Saudi investigation,” Prime Minister Theresa May’s spokesman declared. Britain says it is considering its “next steps” and those responsible for Khashoggi’s death needed to be held to account. Foreign Secretary Jeremy Hunt previously warned there would be “consequences” for British-Saudi relations. May is under pressure to suspend arms sales to Saudi Arabia. Saudi Arabia is the UK’s key ally in the region and a significant trading partner. Many MPs in the British parliament think the UK and the rest of the Western sphere need to rethink their stances on many issues. This could lead to major policy changes, especially in Yemen. Saudi Arabia’s intervention in the war in Yemen is one of the kingdom’s most contentious foreign policy initiatives. Also, in three weeks’ time, sweeping US sanctions will go into effect on Iran, as the US administration seeks to cut off the country’s oil exports. The current crisis could affect US policy towards Iran. President Trump has made crippling the Iranian economy a foreign policy priority. A crisis with Saudi Arabia, which said it would compensate for the shortage of oil supplies after imposing sanctions on Iran, could slow Trump’s plans. As for the Middle East peace plan, it is simply dead in the water. The Saudi image is tarnished, it would be difficult for them to play any meaningful role until this is resolved, according to Western diplomats. For some, the current crisis only magnified the weakness of the US foreign policy in the Middle East. “Trump’s relying on the Saudis was fanciful thinking to begin with. What role are they going to play in containing Iranian influence in the Middle East? That is very unclear. How much are they prepared to do to facilitate Arab-Israeli peace-making? Very doubtful. And it may be that some of their actions in Yemen, Qatar and Lebanon only enhanced Iranian influence,” Aaron David Miller told the Weekly.